The Chozo were primitive, warring tribes when they made first contact with a bug-like race 8,000 years ago. No handshake protocols were enacted between the races. It was simply an invasion from a space-faring race with parasitic tendencies. The aliens called themselves Tourians. The Chozo called them, demons. Despite the Tourian’s aggressive nature, they were not interested in eradicating the Chozo. They sought to integrate them into their hive. If this was impossible to do openly, then it was done forcibly through mental infection. Usually their queen could take over a race quite easily. Once overcome, the queens first bloody act would be to murder all rivals to her domain. There could be only one Mother. In this way the bugs traveled through many star systems encountering and ruining every civilization through the nomadic tyranny. The Chozo were a very unusual find for the demons though. Primitive in the sciences and technology yet extremely gifted with telepathy. The parasites had never encountered so much resistance to their ideas. The Psychic Wars broke out between them, a war of flesh, blood, and mental prowess. Some Chozo scholars think that the Tourian males were too dumb to think for themselves. It was the will of their queen that they followed. Perhaps there were once many hives on the demon’s homeworld. Perhaps the queen had murdered all her rivals there as well. 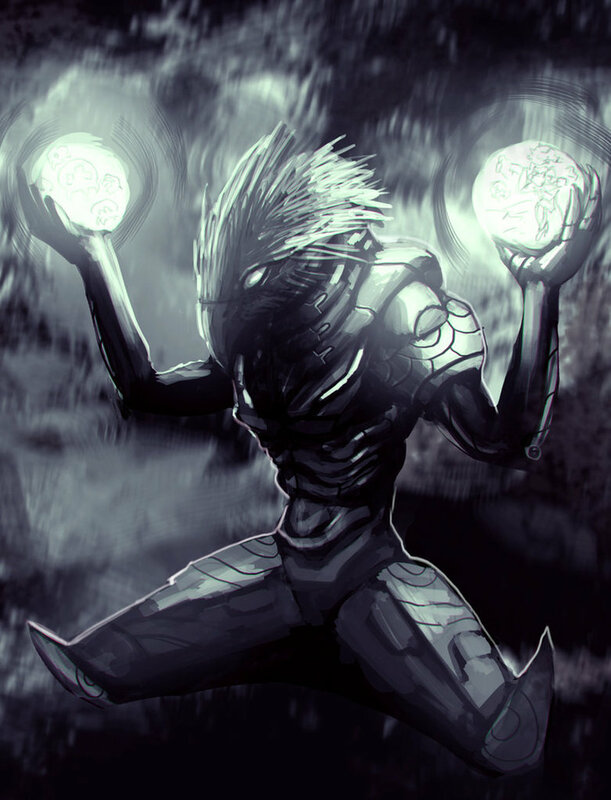 The Chozo’s telepathic abilities kept the demons at bay for a time, yet the ruthless Mother soon found a way to use their powers against them. The birds grew susceptible to mental infection. Chozo men turned against their own kind sparking a civil war. Hundreds of female Chozo were murdered by fathers, husbands, and brothers, honorable minds twisted by the demon who forced them to kill the very females they vowed to protect. All seemed lost until a society was formed to ask help from the Eminent One. Day and night they prayed to their god. No answer came. The society was mocked by nay-sayers who told them to stop praying and start fighting. The nay-sayers were silenced when the Eminent One responded with a second alien contact: a single most powerful warrior. The feathered bard, wrapped in the silver white robes of a storyteller, perched upon the highest branch of the tall Arahn tree. He held two music spheres in his hands, sending out a pleasant screech to all around. Birds of the hunt quieted their chatter into hushed chirps as they beheld his form swaying in the breeze, burning eyes aimed at the lonely bard, ears perked in anticipation. The pale red moon made a fitting backdrop for the melancholy songs that followed. His purring voice reached clear and strong to a speechless audience. Music entered through heart and soul, vibrating into low and high notes that came alive with images. The Living Sound it was called, a musical technique telepathic musicians mastered. The vibrant melodies transcended the natural, perusing into the very core of life and hidden beauty. Newborn stood next to Kerrfu mesmerized by the music. Goosebumps spread about her body as she heard the soulful melodies. Something inside whispered to her heart’s deepest desire, higher and more valiant then her goodwill, stronger then her strength, wiser then her mind could ever be. Everyone’s eyelids slowly closed as was the custom when a song about the Sunborn Warrior was sung. Newborn, unfamiliar with the custom, kept her blue eyes open. The bard held up one of the luminous song orbs. A light tone resonated through Newborn’s head expanding into two different notes. The high note whispered out a gentle melody. The lower one sustained itself conjuring forth images of strength and depth. Newborn realized the light melody was sent telepathically inside her head while the low note was sung out the bard’s beak for all to hear. She wondered if anyone else could hear the light melody meandering about. The low note crescendoed into a sad broken waltz, hovering around a single word: Sunborn. Newborn’s imagination was alive with the striking image of a tall figure clothed in white burnished armor. A large gun completely surrounded the warrior’s right hand. ‘Sunborn was born of a race long destroyed by the demons who came to our lands. So bright her appearance was that it was rumored her race lived in the suns of the sky. Who can tell even now if such a feat is possible. Even in all our time journeying through space, we could not find her homelands. Perhaps it still lies, hidden on some burnished star millions of light-years away. ‘Her appearance beneath the fabled armor was that of yellow from head to toe. It did indeed glimmer like our sun does. She was the only survivor of her kind… the last of her race destroyed by the demons. Her armor was a living being, created by her kind from 24 sacrificed sunborners, designed with one goal in mind, defeat of the Demon Mother. ‘It was with such a vengeful resolve that she sought the mind-eater. She encountered many worlds destroyed in her wake. Nothing remained of them but scattered memories and lost dreams. ‘When the demons invaded us, we made our stand against them. Though valiantly we fought, we could not win. We were taking heavy casualties. Even worse than this were those males who turned against their own. Our telepathic abilities became a curse to us. She wove many enticing lies within our head, some that still remain even to this day. Countless females were slaughtered. Still we held on. We fought and died, praying for help from the Emanate One. ‘The moment Sunborn came it seemed like a joke, as if the Emanate One were mocking us. How could one person stand against so many armies? Then we saw her fight. The living power suit gave her many powers. She could transform into energy, flying without wings, shoot with the powers of the sun, ice, and lightening. More incredible then all of this was her ability to morph into a sphere moving about undetected by the demons. Her speed and agility were unmatched by any who encountered her. All foes fell to their dying knees before such uncanny skill. The might of her anger was indeed most great. Against all odds, she made it into the great dark ship hovering above Chozodia. ‘The Demon Mother had never met another female so powerful. All her tricks of the mind did not work. Sunborn was full of too much vengeance. The battle did not last long. As the great demon tried to flee, Sunborn dealt her a mighty blow. The ship fell to a land that became known as the cursed Crateria. Sunborn escaped the falling ship then collapsed upon the ground severely wounded. Two days later she died. Her suit remained, sentient and patient. Even now it rests in the Shrine of Prophesy, awaiting a time for a worthy hunter to take it up once again. Waiting for a time when vengeance can claim the suit as its own. As the song came to a close, Newborn’s trance of telepathic images shattered into a million pieces. She awakened to find thousands of burning Chozo eyes upon her. Where the bard once stood a new form emerged. Tall and regal the bird spread forth her wings and screeched louder than a roaring Sheegoth. The eyes of all reluctantly shifted towards the proud Chozo Empress. Her voice rang in a powerful telepathic vibe demanding every bird’s attention. ‘How long will this continue?’ She screamed. ‘Back then we fought long and hard against the demons. What is keeping us from fighting these space pirates now? Don’t you understand? If all we had done was wait for Sunborn to arrive, the Demon Mother would have murdered us all. Sunborn would have come too late. Silently the girl climbed on his back. Newborn turned and saw Kerrfu smiling at her. Plogos lunged into the sky flying them west over the forest, towards a desolate rocky terrain. ‘Only to those blinded from the truth,’ replied the bird. Newborn did as commanded and immediately fell asleep under Plogos’ mental gaze. He flew down near a rocky cave. Hooded birds stood there, hunched over a dark blue flame.